Time again to take your fingers off your keyboard and read the State of the Blogosphere, released this morning. 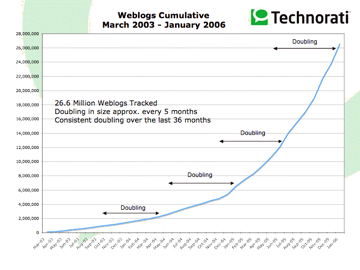 – Blogosphere is over 60 times larger than it was 3 years ago. – a new blog is created every second. – 1.2 million blog posts a day, 400,000 of those are TAGGED. I guess blogging didn’t die off with disco after all. There is a lot of information out there and we all need to TAG better or the right people will never find our stuff. I nominate Adam from the Garden of Eden as the Patron Saint of Tagging. If Adam didn’t take the time to tag the animals, Noah would have had a helluva time sorting out what’s what when it came time to fill the ark. And thats all i have to say about that. Thanks, Andrew, for this home lesson. I´ll try to do this text from sifry.com. i think i will be in stockholm in april for a missions consultation. fancy a coffee and a chat? tagging is just the beginning. the next step to staying on top of information, both publishing it and collecting it, is to create RSS feeds based on those tags. In technorati, this can be done with watchlists. a lot of us stay connected now by the words we use and tagging helps that to happen a little easier and quicker. Agreed! Tagging in Technorati and Del.icio.us helps sort out the clutter. My advice to those who are sceptical: get a tool that helps you use tags efficiently. Then check out the tags at technorati, and see what/who else is tagging the same terms. For those who are less computer minded, get Firefox, then get the Performancing for Firefox Plugin, (both are free). This sets up a script where at the click of a button or menu, the bottom half of the window becomes a wysiwyg/html source editor for blogging. You can post including tags at Technorati and bookmarks at del.icio.us very easily. see http://performancing.com/firefox for more details. It is really easy to use, as it’s a plugin, it self-updates, it’s small as far as programs go, and it doesn’t even have another icon on your desktop. There are still minor bugs with some blog clients, but there are beta releases on the go working towards resolving these issues. I’ve just recently started tagging more and using Technorati and Delicious ( my delicious tags ). And to help me tag more I’ve started using Qumana. Its a nice little program that works with alot of different bloggging tools and allows for one-click t tagging. i use ecto for blogging and that is also one click tagging with technorati. Yeah Qumana is pretty nice, though its still in its early stages, so there are some things that need to be worked on, but all in all its pretty cool. I tried the free-trial of Ecto and it too was nice, but since Qumana is free, well….. I stumbled across your blog while I was doing some online research. While I’ve been blogging for awhile, it really is reaffirming to hear how our forum is expanding exponentially on a daily basis.